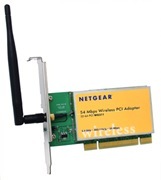 At 54 Mbps, this wireless 2.4 GHz 802.11b/g PCI card is much faster than existing 11 Mbps wireless networks and will supercharge the delivery of media-rich content to your desktop PC as never before. It easily handles huge digital video and MP3 files, firing them through your network at blazing speeds. It gives you continuous access to your home wireless router or office network, saves the time and expense of installing Ethernet cabling when you want to set up or expand a network, and makes it simple to relocate your desktop PC without rewiring.